Now that I've debuted my wolf build, I thought I'd do a write up on how I put it together to help, or inspire, some of you on your own build, or any other build. When I cosplay characters that I have to buy clothing for, I don't tend to buy the screen accurate stuff. I hit the thrift stores, and the outlets/discount stores! Let's start with her bandana's. She has two white bandana's in this outfit. But wait!! That one on her head looks brown! Using a screencap of the wolf who was wearing the outfit before Carol jacked it, it's white, and very dirty. At least that's what I think. 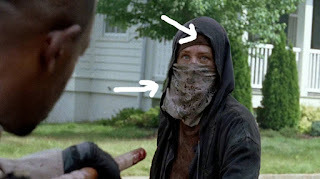 You can get the bandana anywhere, but thanks to the detective work of some serious cosplayers (IDer), it's available at Michael's and Walmart. For the bandana on her head, I actually just went ahead and dyed it brown (it didn't come in brown), then dirtied it up using acrylic paint. The one covering her face I dyed using tea, then dirtied using acrylic paint. and modified it. First, I dyed it darker. Took three tries to get it as dark as I wanted. Then, I cut up the center and added the zipper that came on my jacket. Dirty using acrylics. Speaking of jacket, I started with a dark blue zip up jacket. It had a collar, made of a khaki like material, and wasn't quite long enough, but it worked. I removed the zipper and used it for the hoodie, the dirtied the living daylights out of the jacket. I also used sandpaper to wear out certain edges, like the collar, cuffs, etc. The shirt I found in the mens section at a thrift store. You just want something that is red vintage wash. I put it in a tea soak, then dirtied it with acrylics. The belt is brown with a gold buckle. Make sure to dirty and distress it. The pants are simply dark blue dress slacks. I got these at a thrift store as well, and dirtied them up, also using the sandpaper method to distress. I added blood at the bottom of the pants because she held a lady as she died in her lap, so I thought her pants should have blood on them. They don't in the show, so if you are going for accuracy, skip that part. The shoe's were an amazing find at TJ Maxx. They're a little too light, but the overall look is close. And only $25! Which is a steal considering the screen accurate boots are around $180. I scuffed these with sandpaper, then dirtied with acrylics. I remade the knife and will have a tutorial for that next week. The W on the forehead was obtained using red body paint, with a little black eye shadow mixed in. I also covered my hands in blood for the convention I went to. You're done! Go kill some wolves!